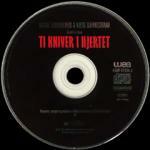 This was the soundtrack album for the film "Ti Kniver I Hjertet" (Ten Knives In The Heart). The 21 track album was released only in Norway and features music by Magne Furuholmen and Kjetil Bjerkestrand. Magne plays the guitar and piano and has also composed, arranged and produced the album. The cover is almost identical to the one for "Ti Kniver I Hjertet (Ottos Tema)" showing a picture of a woman with her hands over the eyes of a man while a man is holding his hands over the mouth of a boy. The CD insert features pictures from the film plus red and white text. The disc is black with red and silver titles at the top with more silver text below.